wow, huge improvements! id say almost perfect, but you should try to remove his mouth and enhance the mustache size. then it’d be perfect. The mustache could be a bit larger/longer. I’ll try that. 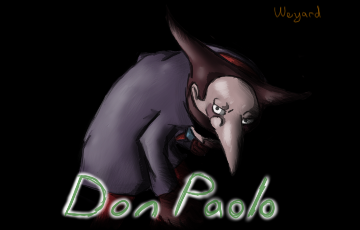 He’s on Ganondorf so his proportions would be correct and somewhat accurate to Don Paolo’s. If this model was just on Wario, he would be far too short and fat. Plus Ganondorf’s move-set already fit’s him nearly perfectly. My next version will only have 2 glitches, because as far as I know, they are not fixable. (Feet going underground during certain animations and holding opponents/items in the wrong position). Neither of which effect gameplay in the slightest. Really, the lack of a shield is the only thing that’s wrong with him now. Anyways, this looks nice. An excellent contribution to the Layton project. Weyard, I sent you a PM on KCMM forums with a fixed shield. O.o I missed that message somehow. It’s almost a page back in my inbox lol. I’ll update it right way. Thank you very much, again XD. I don’t have a Digital recording device of any sort. I have a lame digital camera that has recording tacked on, but it won’t let transfer anything over 30 seconds onto the computer for some reason lol. I’m getting a good camera sometime between now and Christmas, so I’ll have videos by then. If anyone wants to make a gameplay video for him, go ahead and I’ll add it to the post.